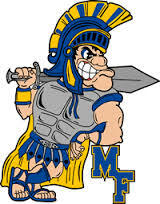 The Maroa-Forsyth Trojans outscored Sangamon Valley 23-2 in the second quarter Wednesday night, propelling them to a 69-55 victory Wednesday night in non-conference boys basketball action. Danish Mahmood led the Trojans with 20 points and Jaxson Nelson scored 16 points. Ian Bennen added 12 points. Nathan Doty scored 16 of his team leading 26 points in the first quarter and Seth Manion added 11 points for the Storm. The Trojans return to action tonight in the Macon County tournament, taking on Meridian at 8:30 pm.